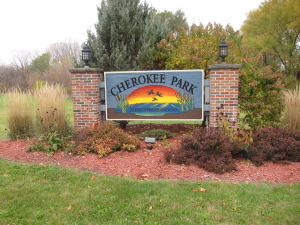 Listed below are homes for sale in Cherokee Park, a neighborhood located in North Madison, WI. Listings are updated multiple times a day from the SCWMLS. For more information about any of these Cherokee Park homes for sale, just click the "Request More Information" button when viewing the details of a property. We can provide you with disclosures, past sales history, dates and prices of homes recently sold nearby in Madison, and more. And, for your convenience, register for a free account to automatically receive email alerts whenever new Cherokee Park listings come on the market that match your search criteria. Cherokee Lake to the north; Cherokee Golf Course to the east; Cherokee Canal and Cherokee Marsh to the South; Yahara River to the west. 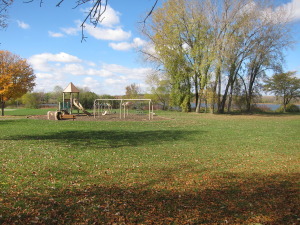 Located at the Yahara River’s headwaters, Cherokee Park is surrounded by the Cherokee Marsh, Cherokee Lake and Cherokee Golf Course. It’s easy to understand why neighbors call Cherokee Park “cozy and comfortable.” A neighborhood directory that is published biannually ensures that it’s easy for neighbors to stay in touch. Odds are, however, that you’ll bump into your neighbors at the holiday parties, garden tours and community picnics held in Cherokee Park before you read their names in the directory. Outside Cherokee Park, the north side of Madison will continue to be the object of city efforts to transform the area into a northern gateway for the city. Plans call for more footpaths, more green spaces, improved streetscapes and renewed architectural standards through the area’s main commercial corridors. Cherokee Park was developed in the early 1980s. Many of the original homeowners still live in the neighborhood today because of its close proximity to both natural areas and urban convenience. Cherokee Lake, Cherokee Marsh and Cherokee Country Club encapsulate the neighborhood — and the 17-acre Cherokee Park runs along the neighborhood’s western border. Single-family homes are located throughout the neighborhood, and a selection of townhomes and condominiums also front Cherokee Marsh along Comanche Way to the south. Cherokee Park attracts many young families because its just down the road from Gompers Elementary School and Blackhawk Middle School, so kids in the neighborhood are just a short walk from class. The north side of Madison is a hub of economic activity with more than 22,000 jobs in the area. Organizations like Covance, Dane County Regional Airport and Ale Asylum Brewery make their homes here. Warner Park, which is home to the Madison Mallards semi-professional baseball team, is also a northside mainstay. Retailers and restaurants are available along the East Washington Avenue commercial corridor just miles from Cherokee Park, and East Towne Mall is about seven miles east of the neighborhood. Fast access to the area’s major traffic arteries simplifies the commute to surrounding communities as well. Downtown Madison is about seven miles south, Sun Prairie is about 10 miles northeast, Waunakee is about seven miles northwest and Middleton is about 11 miles west of Cherokee Park. For information about finding a home in the Cherokee Park neighborhood or to sell your Cherokee Park home, contact our team for a better real estate experience. 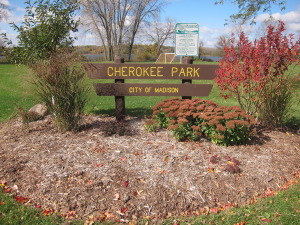 The Cherokee Park neighborhood is located on the North Side of Madison in MLS area Madison – E03. Below are more homes for sale in that area.